Inspired from the texture and grain in leather, this Textured Lokta Origami Paper features veins and texture of leather in a dark red-brown color scattered against the handmade natural Lokta paper. Both the paper and the leather design are crafted by hand by paper artisans in Nepal. Inspired from the veins and texture in leather, this Textured Lokta Origami Paper takes natural designs to a whole new level integrating both texture and color to create the look of leather. 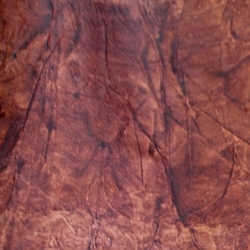 Dark, red/brown color and veins combine to create the look of rich leather on each natural-colored sheet.